Aries offers a very power efficient, rugged low inertia servo controlled voltage stabilizer to safe guard your expensive equipments. It serves as a 24 x 7 x 365 watchdog against power disturbances sophisticated power equipments & entire electric loads form the hazards of low / High Voltage Fluctuations. It assures a regulated constant Voltage Supply to the entire connected load of any facility. 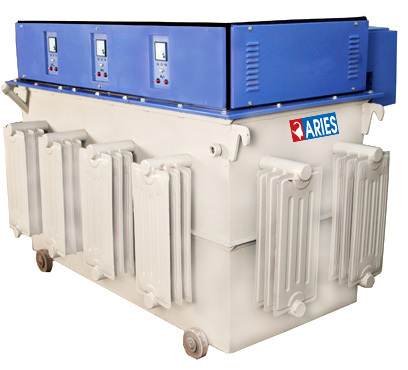 Aries Servo Voltage Stabilizers offers a unique power saving technology helping in the reduction of MDI & directly reduces the power losses which would bring about Electrical Energy Conservation resulting in reducing Electricity Bills ( Saving Money on Power ) Hence Energy saved is Money saved thereby helping in Nation building. Instant Response by an AC Motor for Fast Voltage Correction even on Adverse Supply Conditions Continuously. Maximum Energy Savings Due to High Efficiency & latest Circuitry & Transformer Designs. Best Branded & Highest Quality Raw materials & Components are used. Transformers with Prime Grade CRGO lamination, High Purity of Electrolytic Copper Wires are Used. Connections by Heavy Bus Bars, Strips & Cables. High Speed of Voltage Correction 10 V – 105V/sec. Variable Transformers are Machine Wound with Special Carbon Brushes for longer serving life. Adjustable Output Voltage as per Customers Requirements. Boosts the Production & Performance of Equipment’s, Process Plants & Machineries. Minimal Breakdowns, Tripping & No Time Loss. Directly improves the MDI& functions as a power saver (Moneysaver). 100% Depreciation Claim 100% allowed on Servo Voltage Stabilizer as per Income Tax Department Act/ Relevant sections Provisions can be checked also. The ARIES SERVO VOLTAGE STABILIZER cost can be recovered in a Period of 18-24 months by Saving on Expensive Power & No Failure/damage / breakdown of Equipment due to erratic voltage. ARIES SERVO VOLTAGE STABILIZERs are designed Specially as per customers’ requirements/ conditions. High Efficiency Saves Energy & Reduces Power Losses. Boosts Production & Optimum Performance of Machinery, plant & Equipment. Reduces Electricity Bills upto 20 % approximately. Saves Money Wasteage on Diesel cost at High & Low Voltage. Balanced Output Safeguards & Assures Longer Life of valued Equipment. Prevents Frequent Breakdowns, Tripping & Time Loss. Improves MDI & acts as a Power Saver . Recover Servo Stabilizer Cost in 18-24 months approximately. Customised Designing for Specific Requirements. Correction Speed 10-105 Volt per Sec. Expoxy Control Card for easy serviceability at site. Step 2 : Account All Reactive Loads.